The first serviceable steamboat, the North River Steamboat (apparently erroneously called the Clermont, and called by some "Fulton's Folly"), began its first journey, traveling from New York City to Albany. The first official air mail delivery (in a balloon) took off from Lafayette, Indiana, bound for New York City. Weather issues forced a landing in Crawfordsville, Indiana, the mail reached its final destination by train. J. Palisa discovered asteroid #295 Theresia. L. Carnera discovered asteroid #476 Hedwig. M. Wolf discovered asteroid #2483 Guinevere. C. Jackson discovered asteroid #1282 Utopia. GIRD-09, the first hybrid (liquid oxidizer/solid fuel) rocket in the USSR, designed by M. K. Tikhonravov, was launched to an altitude of 400 meters. The design altitude of 5000 meters was not reached due to loss of pressure integrity of the motor flask. K. Reinmuth discovered asteroid #1404 Ajax. Died (air raid, Peenemuende), Walter Thiel, German rocket engineer, lead engine designer, in charge of V-2 engine development. Had Thiel remained alive, a simplified 25 ton thrust engine probably would have been completed in time for production. The first telephone call was placed on AT&T's "microwave radio-relay skyway," the first facilities to transmit telephone conversations across the United States by radio rather than wire or cable. The launch of Pioneer 0 (Able 1), the first US attempt at a Lunar mission, failed when the Thor booster exploded at T+77 seconds at an altitude of approximately 9 miles (16 km). Thor-Able 1 (Pioneer 0), launched 17 August 1958, was the first US attempt at a Lunar mission, and the first attempted launch beyond Earth orbit by any country. The Pioneer 0 probe was designed to go into orbit around the Moon and carried a TV camera and other instruments as part of the first International Geophysical Year (IGY) science payload. The spacecraft was destroyed by an explosion of the first stage (Thor booster number 127) 77 seconds after launch at 16 km altitude, 16 km downrange over the Atlantic. Failure was suspected to be due to a ruptured fuel or oxygen line or a faulty turbopump gearbox. Erratic telemetry signals were received from the payload and upper stages for 123 seconds after the explosion, and the upper stages were tracked to impact in the ocean. The original plan was for the spacecraft to travel for 2.6 days to the Moon at which time a TX-8-6 solid propellant motor would fire to put it into a 29,000 km Lunar orbit which was to nominally last for about two weeks. The second stage (S-IV) of the Saturn C-1 launch vehicle was successfully static-fired for the first time in a ten-second test at Douglas Aircraft Company's Sacramento, California, facility. NASA launched Pioneer 7 into solar orbit to monitor the solar wind and cosmic rays. Pioneer 7, launched 17 August 1996, was the second in a series of solar-orbiting, spin-stabilized, solar-cell and battery-powered satellites designed to obtain measurements of interplanetary phenomena from widely separated points in space on a continuing basis. The spacecraft carried experiments to study positive ions and electrons in the solar wind, the interplanetary electron density (radio propagation experiment), solar and galactic cosmic rays, and the interplanetary magnetic field. Its main antenna was a high-gain directional antenna. The spacecraft was spin-stabilized at about 60 rpm, and the spin axis was perpendicular to the ecliptic plane and pointed approximately toward the south ecliptic pole. By ground command, one of five bit rates, one of four data formats, and one of four operating modes could be selected. The five bit rates were 512, 256, 64, 16, and 8 bps. Three of the four data formats contained primarily scientific data and consisted of 32 seven-bit words per frame. One scientific data format was used for the two highest bit rates. Another was used for the three lowest bit rates. The third contained data from only the radio propagation experiment. The fourth data format contained mainly engineering data. The four operating modes were (1) real time, (2) telemetry store, (3) duty cycle store, and (4) memory readout. In the real-time mode, data were sampled and transmitted directly (without storage) as specified by the data format and bit rate selected. In the telemetry store mode, data were stored and transmitted simultaneously in the format and at the bit rate selected. In the duty cycle store mode, a single frame of scientific data was collected and stored at a rate of 512 bps. The time period between which successive frames were collected and stored could be varied by ground command between 2 and 17 minutes to provide partial data coverage for periods up to 19 hours, as limited by the bit storage capacity. In the memory readout mode, data were read out at whatever bit rate was appropriate for the satellite distance from the Earth. USSR launched Venera 7 toward Venus, the first spacecraft to return data after landing on another planet. Venera 7 was launched 17 August 1970 from a Tyazheliy Sputnik in an Earth parking orbit towards Venus to study the Venusian atmosphere and other phenomena of the planet. 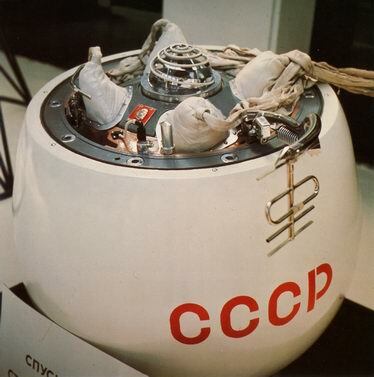 Venera 7 entered the atmosphere of Venus on 15 December 1970, and a landing capsule was jettisoned. After aerodynamic braking, a parachute system was deployed. The capsule antenna was extended, and signals were returned for 35 minutes during descent through the atmosphere. Another 23 minutes of very weak signals were received after the spacecraft landed on Venus. The capsule was the first human-made object to return data after landing on another planet. L. Zhuravleva discovered asteroid #2576 Yesenin. The Double Eagle II completed the first transatlantic balloon flight when it landed in a barley field near Paris, 137 hours after lifting off from Presque Isle, Maine. Robert Rowe Gilruth (8 October 1913 - 17 August 2000) was an American aviation and space pioneer, a long-time NACA engineer working at the Langley Aeronautical Laboratory from 1937-1946, then as chief of the pilotless aircraft research division at Wallops Island from 1946-1952. He explored the possibility of human spaceflight before the creation of NASA, served as assistant director at Langley from 1952-1959, and as assistant director (manned satellites) and head of Project Mercury from 1959-1961, technically assigned to the Goddard Spaceflight Center but physically located at Langley. In early 1961 Glennan established an independent Space Task Group (already the group's name as an independent subdivision of the Goddard center) under Gilruth at Langley to supervise the Mercury program. This group moved to the Manned Spacecraft Center, Houston, Texas, in 1962. Gilruth was then director of the Houston operation from 1962-1972. In the beginning of his career he was involved with early research into supersonic flight and rocket-powered aircraft and then with the manned space program, including the Mercury, Gemini and Apollo projects. He worked for the National Advisory Committee for Aeronautics from 1937 to 1958 and its successor agency, the National Aeronautics and Space Administration (NASA), until retirement in 1973. Gilruth was born in Nashwauk, Minnesota. He attended and completed high school in Duluth, Minnesota. Gilruth received a bachelor's degree in aeronautical engineering at the University of Minnesota, and received his master's degree in 1936. When NASA was created, Gilruth became head of the Space Task Group, tasked with putting a man in space before the Soviet Union. When that didn't happen, Gilruth suggested to President John F. Kennedy that the United States should announce a bigger goal, such as going to the Moon. Soon the Apollo program was born, and Gilruth was made head of the NASA center which ran it, the new Manned Spacecraft Center (MSC) (now the Johnson Space Center). Gilruth served as director of the MSC until 1972 and oversaw a total of 25 manned spaceflights, from Mercury-Redstone 3 to Apollo 15.